The Balt LapMaster, Model 42052 (Black) is an adjustable mobile workstation that accommodates a laptop computer, small printer, and accessory items. 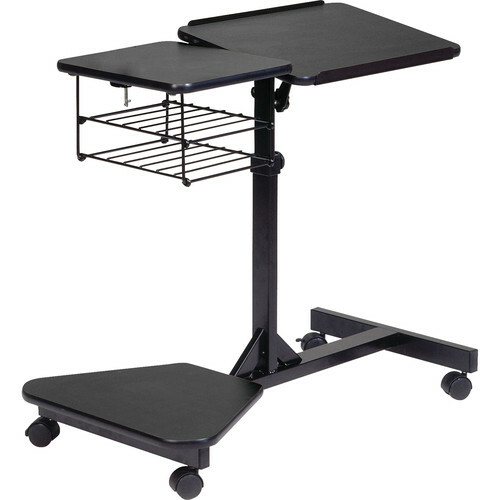 This workstation is a utilitarian piece that will work in any number of scenarios. As a classroom tool, it will accommodate all you need to teach a lesson. As a factory item, it can be rolled around from department to department. Box Dimensions (LxWxH) 32.0 x 27.0 x 5.0"
LapMaster, Model 42052 (Black Laminate with Black Frame) is rated 5.0 out of 5 by 1.